How you can have an enjoyable multi-day hike without collapsing halfway through it. What's the most extreme scenario you could face on a hiking trip? Encountering a bear, maybe? Implausible as it may sound, you've got to have your combat skills in place. Or your fleeing skills, if fighting back is just not your style. It won't be easy, but it's better than becoming some hulking creature's dinner. Oh well, enough with the scare tactics already. 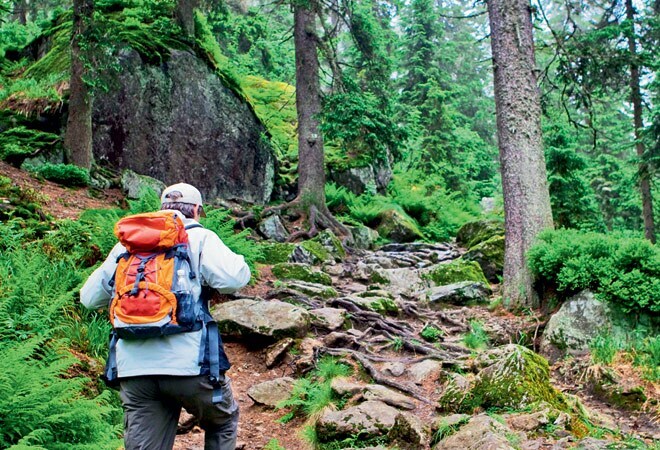 Here's how you can have an enjoyable multi-day hike without collapsing halfway through it. To get your body accustomed to carrying a 15-kg backpack, start with twokm hikes about thrice a week. Depending on your speed, this should be a 30-45 minute brisk walk. Prior to the hike, do some basic warm-up exercises. Spot jogging and stretching should help. Hiking on flat terrain is very different from walking uphill and downhill, and you need to engage those particular muscles when preparing yourself. Most of us are not blessed with naturally hilly terrain in the immediate vicinity, so try training on the stairs or an aerobic step machine. Go on, tire yourself out. Carrying loads forms an important part of your training routine. Steadily increase the weight of your expedition pack until you're able to finish a 12-km hike with a 10-kg backpack. Keep increasing the weight till you're able to carry 25 per cent of your body weight. Evaluate your progress each day and increase load and distance very gradually. You may have to be ready for a multi-day hike in three weeks, but don't push yourself too much, too quickly. For the second week, stick to carrying your backpack on easier terrain. Throw in a few squats and lunges in your training routine to improve balance. Your body needs to be at its comfortable best to perform. Footwear is crucial because your feet bear the brunt of your weight and good hiking shoes can prevent blisters, muscle aches and skin irritation. Also, your backpack should have broad or cushioned straps that do not dig into your shoulders.